I’m slowly but surely losing my mind. I urinated on my feet this week. It’s not something I did willingly or enthusiastically. In fact the whole experience was a little unsettling. Cynthia and I enjoyed a couple of hours away from the boat on Thursday evening with a discovery day guest from earlier in the year. Retiree Ian Kirkup wanted to find out if he could comfortably handle a narrowboat on his own. After a seven hour cruise through twelve hours of stunning Warwickshire countryside, obscured to some degree by driving rain, we spent an hour and a half negotiating three descending and then three ascending locks in the Calcutt flight. Ian found the day very useful indeed. He decided that his limited mobility would prevent him from enjoying a life afloat. He still wanted to live a gypsy lifestyle so decided that his best option was to buy a well-equipped motorhome. It’s a beauty. After two very pleasant hours discussing the practicalities of living for extended periods in a space which makes our 62’ boat look cavernous, we trudged back to the boat through thick mud along a darkened towpath falling down holes, tripping over roots and being raked by hedgerow brambles. We had, of course, forgotten to bring a torch with us. Apart from tripping over the bollard our boat’s bow is tied to we climbed back on board without incident. Because of my advanced age, tennis ball sized bladder and copious quantities of tea, my most pressing need was to have a wee. I headed for our bathroom and smiled lovingly at Cynthia as she passed me carrying a bucket sized, foul smelling plastic container, whipped my trousers down to use our composting toilet, sat down and let loose. The composting toilet has been on board now for eight months. The first time I used it for liquids I remember thinking that the sound of water splashing into the empty container at my feet sounded very much like liquid splashing directly onto the bathroom floor. I was reminded of this initial impression again on Thursday night, moments before I realised that the sound really was liquid splashing onto the floor. The container which I had clearly seen Cynthia carrying was the missing wee bottle. There was no harm done other than the few bruises Cynthia gained when she fell over laughing after climbing back back into the boat with the empty liquids container and saw me crawling around the bathroom floor with my trousers around my ankles busily mopping the floor with a handful of blue roll. That was probably the highlight of our week. The problem with mooring in one spot for weeks on end is that I don’t have an awful lot to report. I work for four days, then relax for three, but I do very little boating. All of that will change in just three short weeks when my work for Calcutt Boats ends. I’m not sure where we’ll go yet. We’ll have three weeks free before heading north to the Isle of Skye for our wedding. We’ve decided on a rather unconventional honeymoon. We’re going to hire a motorhome so we can explore the Scottish highlands in comfort. We have an ulterior motive. We want to see how I feel living in the much smaller space available in even a large motor home after the relative spaciousness offered by the fifty feet long cabin on our 62’ narrowboat. If I can endure or even enjoy the experience we will be number crunching to see if we can afford a reasonably comfortable motorhome of our own to use to explore somewhere a little more pleasant than winter-time Britain. We will continue to spend most of our time afloat. Even though a motor home would allow us escape for two or three months of dreary winter weather, I can’t think of a better way of spending the warmer months. A motor home may allow us to reach southern Europe in comfort but the actual travelling won’t be as peaceful or as stress free as cruising at two or three miles an hour. Back to boating then, and a subject which I am often asked about. I appear to be a reasonably competent and confident boater now, but how did I feel when I first moved on board? Many aspiring narrowboat owners are daunted by the prospect of handling such large and ungainly craft on their own. They are worried about mooring techniques, which knots to use, waterways etiquette and rules, lock negotiation, and the many differences between living in a house and living afloat. If you’re considering moving afloat and are overwhelmed by the prospect, I hope that the following summary of my experiences to date will reassure you that if I can do it, anyone can. I moved onto my current boat on 2nd April 2010. I knew nothing about boats. In fact, I wasn’t particularly interested in boats or living afloat. I just needed somewhere, anywhere, to live away from my matrimonial home. After a disastrous business failure culminating in bankruptcy, the resulting financial strain was the last nail in my marriage’s coffin. I had no savings and very little income. Six months before moving afloat I started working part time at a marina. I loved working on the extensive grounds there but I earned very little. I needed to move out of my house, but I couldn’t afford to rent the most modest of flats. Because of my bankruptcy I probably wouldn’t have passed the letting agents’ screening anyway. There are 250 boats moored at Calcutt Boats on two marinas. My daily work involved working close to the boats cleaning and repairing the wooden piers and sometimes moving the boats from their moorings so that they could be repaired or painted. Some appeared to be neglected and unused. One, on a quiet mooring at the western end of Calcutt Boats’ Meadows marina, was in a particularly dilapidated condition. Paint hung in ribbons off the boat’s windward port side. The gunnels were thick with flaking rust. A tattered lichen smeared cratch cover sagged over the front deck’s peeling paint. The edges of the cabin’s five masonite roof panels curled towards the sky allowing rain to pour into the boat in all but the lightest showers. Ill fitting and rotting wooden hatches over two pairs of side doors and the engine room allowed rainwater to flow down the internal parana pine cladding. The boat was a mess. The engine room doors were unlocked so, on a cold February day, I climbed over a rickety coffin shaped wooden box covering the dusty engine, swept aside thick floor to ceiling cobwebs and stepped inside. I didn’t particularly like the boat’s interior. In the depths of winter the boat’s cabin was very cold. Rainwater dripped from discoloured patches in the pine clad roof, dead flies dotted every surface, mould-covered curtains and seating, the stove flue was cracked and the stove glass was broken. What probably bothered me most was a large brown stain in the centre of a sagging mattress on the fixed double bed in the rear cabin. I didn’t like the boat or know anything about boating. I didn’t really want to live afloat. All I needed was somewhere to live away from the woman who was slowly but surely driving me mad. I’m sure she felt the same about me. I discovered that the boat was owned by my boss, marina owner Roger Preen. After a short meeting with Roger and his wife Rosemary they agreed that I could pay them a nominal rent to live on board. I moved on board on my fiftieth birthday. The boat was barely habitable. I spent a week running a powerful dehumidifier for twelve hours a day to try and remove the damp, and then had to do it all again after I inadvertently flooded the rear cabin after discovering that (a) a 350 litre tank doesn’t take an hour to fill and (b) a split filler hose between water tank and deck was allowing the excess to drain into the cabin bilge, flow back to the engine bilge and then slowly fill up the inside of the boat from the rear. That aside, my first six months were idyllic. Grassed banks carpeted by a stunning array of wildflowers stretched in front of my mooring. Behind me, a half acre tree-studded island rose from twenty feet of clear water filled with shoals of roach, predatory pike and perch, and small groups of battleship sized carp. Mallards squabbled over mates, coots bolted comically through the bankside reeds and an ungainly cob swan chased a dozen Canada geese across the sparkling water. Each day I finished work at 5.30pm, strolled along a woodland path back to my new home and then sat reading for hours in the early evening sun at a table on the front deck. I very quickly fell in love with the lifestyle. With very little money coming in from a hugely enjoyable but low paid outdoor job I couldn’t afford to remedy any of the boat’s many ailments. I had no confidence in the engine, the unstable construction covering it was dangerous, water poured through the rapidly deteriorating roof and through ill fitting hatches, the absurd bath was just deep enough to wash a very small baby, the gas water heater was so temperamental that showering was as unpleasant as it was dangerous, the water tank filler hose leaked, the stove flue was cracked and the original electrical system, installed in 1977, was woefully inadequate. I loved the boat as a home but I had no interest in using it to explore the waterways network. In fact, I was only vaguely aware that a network existed at all. The boat was a reasonably acceptable floating home. It was somewhere to lick my wounds while I considered what to do next, but the options I considered didn’t include waterways cruising. The thought of using the boat for anything other than a floating flat frightened me. I didn’t take the boat out of the marina for eighteen months and then when I did, I broke down twice. The first breakdown was due to a blocked and almost inaccessible fuel filter. The second breakdown occurred after my gearbox oil leaked out of two perished hoses. If I had known the first thing about engines I would have realised that after spending thirteen years languishing unused on a marina mooring, all of the perishable pipes and hoses needed replacing. 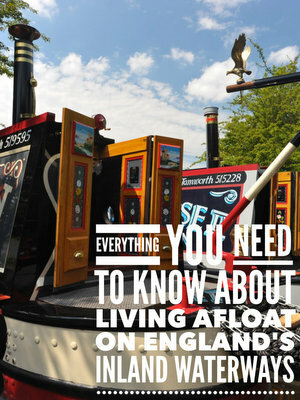 During my first few months on board I learned an enormous amount about narrowboats in general and mine in particular. Every day I worked with engineers, marine electricians, fitters and painters, many of them boat owners themselves. Every day I discovered more about the boat I lived on and what a beautiful and well appointed boat is used to be. I learned from the people around me, and I learned by making plenty of mistakes. I flooded the boat from the bow twice thanks to a split and inaccessible filler hose. I almost flooded the boat three times from the rear when the raw water cooling system failed and dumped gallons of canal water into the engine room bilge in just a few minutes. Most of the time I worked on the water at the marina. Sometimes, inadvertently, I worked in it too. I have fallen into the marina or the canal spectacularly on three different occasions. The first, two months after I started working there, was on a bitterly cold winter’s day. An icy crust covered the water, catching the hull of the boat I was trying to pull towards me against a lively north westerly. The painful lesson I learned that day was not to lean backwards over water while pulling on a centre line with all my might. The knot slipped causing me to do a backward somersault through the ice into the muddy water beneath, much to the amusement of those around me. I suffered no injuries other than a bruised ego, dented pride and a mild case of hypothermia. A very important lesson I learned in the early days was how to handle locks safely. Locks caused me no end of confusion and anxiety initially but I was very lucky. A very pleasant part of my job at Calcutt Boats was moving narrowboats between wharf and marina. ThIs involved negotiating two wide locks, initially with another member of staff. I found locks very confusing. I wasn’t sure which paddles to raise or why I needed to raise them. I sometimes opened paddles in the wrong order or both upstream and downstream paddles at the same time, much to the amusement of the more experienced members of staff who accompanied me. Shortly after I had mastered the basics of passing through a lock safely, the company asked me to take a brand new boat they had just built on a thirty nine hour cruise down the south Oxford canal and onto the Thames where it was being exhibited at the IWA boat show at Beale Park near Reading. I lost their pride and joy at the first lock I encountered. I left my twelve year old son on board making tea while I moored the new boat beneath the bottom lock in the Napton flight then left it to set the lock. I was so busy concentrating on manfully winding up the paddle as fast as I could to notice the effect that the surge of water leaving the lock was having on my poorly tied boat. The knot came adrift allowing the boat to float into the middle of the canal, my son, Brook, standing trembling lipped on the front deck with steaming mug of tea in his hand. Two laughing local boaters brought the boat back to me. Over the months which followed I became a proficient boat handler and full time liveaboard boater. One of the most important pieces in the jigsaw was understanding on board electrics and how they differed enormously from those in a bricks and mortar home. I learned about the relationship between power generation, storage and consumption and how balancing the three is the most difficult aspect of liveaboard life. I made many mistakes when I first started boating. I still make some now. It’s very easy to be distracted by the wonderful scenery or wildlife as I cruise but I don’t mind. Narrowboats are very forgiving vehicles. The occasional bump or scrape isn’t going to do any harm. All of this is very good news for you. I don’t pick new skills up particularly quickly, I am rubbish at DIY, and I make many silly mistakes. If I can competently manage living afloat and steer my boat along the inland waterways, you can too. Once you have mastered the basics you can begin to relax and enjoy exploring the wonderful inland waterways network at a very gentle pace. You will make many mistakes when you first start boating. You will make less if you invest in a little training first. There are many companies offering RYA accredited helmsmanship courses for the inland waterways. Alternatively you can join me for a more comprehensive discovery day and learn about the practicalities of living afloat as well as boat handling. You can find out more about my days here. All is not well with local online moorers. There’s a thief about. A spineless b****d, or maybe two or more of them, has broken into two boats moored on the combined Oxford/Grand Union canal running between Napton and Braunston junctions. Is there a name for a group of thieves? You have a troop of monkeys, a pack of dogs or a herd of cows. How about a vermin of thieves? One of the boats, owned by newsletter reader Chris Dobbie, was moored close to Tomlow bridge between Napton and Braunston junctions. The thief forced a side hatch to gain entry then stole a waterproof coat, a quilted coat, walking boats, a beanie hat, gloves and a pair of old trainers. Unusually, they left behind other items which would have been easier for them to dispose of. A rucksack was stolen from the second boat before a dog scared them off. We can only hope that the thief trips over while wearing the unfamiliar walking boots and falls into the canal, but not until he has knocked himself unconscious first. I sincerely hope that he encounters one or two boat owners who are more than happy to deal with his antisocial behavior and save the local police force the trouble of turning up far too late and then promising to do nothing at all. In case you think I’m being a little too harsh, I’ve been burgled five times in the past. The thieves have never been caught. I don’t know about all of you out there, but in the past I used to be in a quandary over how to choose the best thing to do. This would include where to vacation, or perhaps which museum to visit or how should I spend my day. After much hand-wringing and soul-searching and a lot of research, I started entertaining the thought of why not do both? With a bit of imagination and open-mindedness, it often worked out that when I was in doubt about what to do, I found with a little artful manoeuvring I could do both! The reason I bring this up, is because Paul and I have been discussing on and off over the winter how nice it would be to plant ourselves in the warmer climes and soak up the sun, instead of slogging through the mud, leaning into the biting wind and cold as we make our way to wherever we need to be. We started discussing motorhomes in earnest this past week, and now it seems to be the reigning topic at hand. We have spent hours surfing the Internet and reading the various blogs describing all aspects of motorhome traveling and living. Yesterday (Saturday) was rather nasty weather-wise, and we decided to forego our usual National Trust property visit and head to Weedon (30 minutes drive from us) to see some of these beauties firsthand. The people there were very accommodating and gave us free rein to look at the vehicles that we fancied. Well, the first one provided everything we were looking for, so even though we glanced at several other models, we knew we had found the one that resonated best with us. After returning home Paul was able to locate the same model and layout online, but a few years older and much more in line price-wise for us. So now we begin the process of putting the pieces of the puzzle together to make this work……we will keep you posted! I love discovering ways to find a balance in all aspects of my life, but particularly when it comes to making choices about where to go, what to eat etc. I remember once when I was on a Paris layover I had spotted the dessert tray when we walked in the door. They had a mouth-watering lemon tart, as well as an equally delectable apple tart. I wanted a little of each, so I asked our server if this was possible and the next thing I knew voila, I was able to enjoy both. Applying this to continuous cruising, think about the opportunities to see many things along the way. With enough flexibility and use of your imagination you can extend your horizons and enjoy much more than you thought possible. Just give it a try…. Several people have asked if I might include a recipe with the weekly newsletter, but we decided against this as Paul has said in the past there really hasn’t been must interest. However, with that in mind, for those of you who are interested in such culinary delights, here is the blog I use so much for what I cook—www.eatliverun.com. Wishing you a good week of creative imagination—go out and make things happen!